The Garden of Eden quilt block is another block that falls into the category of uneven nine patch, so called because the three rows making up the nine patches are not all the same width. However, the good news is that the sewing method is the same for any nine patch with equal sided units. 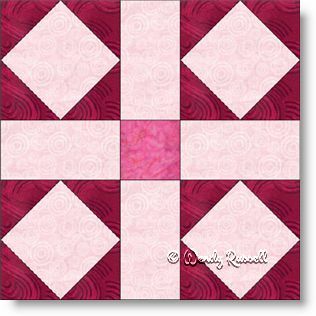 This quilt block is a perfect block to introduce the quilter to the square in a square patch, resulting in a square set on point. This is a common patch used in many quilt blocks. The sample quilts illustrated give you an idea of different ways to lay out your final quilt to make it your own.